See Mars Near the Moon in the Night Sky Tonight! Here's How. See Mars snuggle up to the moon on Dec. 14, 2018. The Red Planet will be about 3 degrees north of the moon in the evening sky. 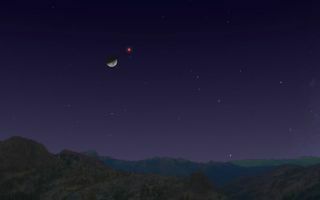 The moon lights the way to the Red Planet tonight (Dec. 14) as the two objects make a close approach to each other in the evening sky. If you gaze up at the moon after dusk, Mars will be easy to spot — weather permitting, of course — and will look like a yellow-orange star nearby. You may even spot some some "shooting stars" from the Geminid meteor shower, which peaked last night and will remain active for a few more days. Their closest approach, however, will happen a couple hours after the conjunction, at 10:53 p.m. EST (0153 GMT on Dec. 15), when the two objects will be 3.4 degrees apart. To put that in perspective, your clenched fist held at arm's length measures about 10 degrees wide. The waxing crescent moon, just one day shy of reaching first-quarter phase, will be 41 percent illuminated, while the Red Planet is shining at magnitude 0.2 — about as bright as Rigel, the brightest star in the Orion constellation. The moon will be in conjunction with the planet Mars on Dec. 14, 2018 at 6:23 p.m. EST (2322 GMT). You can spot the pair in the constellation Aquarius after sunset. Both Mars and the moon will be in the constellation Aquarius. Look for them above the southern horizon after sunset. For observers in New York City, the pair will set in the west at 11:21 p.m. local time. You can find out exactly when Mars (and other visible planets) rise and set from your specific location using timeanddate.com's astronomy calculator. If you miss tonight's conjunction, you won't have to wait long for another chance to see Mars snuggle up to the moon. The two will be in conjunction once more on Jan. 12. However, they will be slightly farther apart, at a distance of 5.3 degrees. Mars also won't be as bright then. At magnitude 0.6, it will be about as bright as Hadar, the second-brightest star in the constellation Centaurus.